When it comes to chocolate chip cookies, everyone’s got their tricks. Some people like to stick to the basic recipe on the back of the chocolate chip bag and some people swear by rotating the sheets halfway through the baking process. We won’t knock your tried-and-true recipe, but we will tell you what makes a huge difference in how these bad boys come out. Here are the five best cookie tips we’ve got. Happy baking! 1. All ingredients should be at room temperature before baking. Yep, even the eggs, and especially the butter. Keeping all your ingredients at room temperature allows for more even baking. Keep in mind that eating the cookie dough, particularly when ingredients sat at room temperature, comes with a risk. 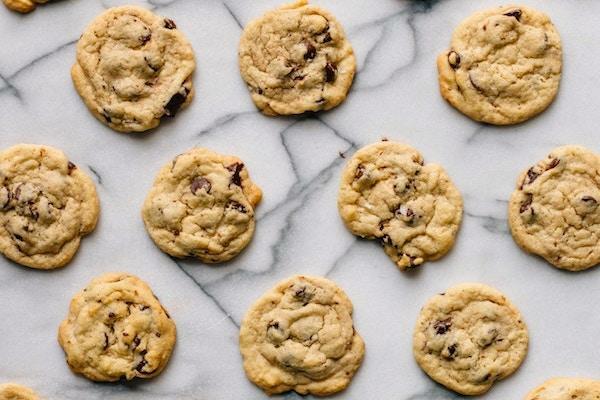 We know, it’s our favorite part of making cookies, too, but trust us when we say the final results are definitely more worth it than eating the dough raw. If you haven’t had brown butter before, it’s pretty much the most magical way to transform plain old butter. In a saucepan on medium-high heat, butter is added and stirred until it smells nutty and fragrant and its color turns dark amber. The butter sits until it’s at room temperature, then you can add it right in the same way you would with solid butter. While solid butter is certainly good enough to make great cookies, brown butter takes them to another level, thanks to the nutty, caramelized flavor. We can’t praise it enough, honestly. 3. Ditch the chocolate chips for the good stuff. 4. Always use 100 percent pure vanilla extract (or, if you can, vanilla bean paste). Vanilla is one of the major essentials when making chocolate chip cookies and for good reason. It brings out the other ingredients’ flavors and offers a subtle sweetness that sugar just can’t. While it can be confusing to differentiate between the two, don’t buy imitation vanilla over vanilla extract. The imitation stuff tastes phony and includes ingredients that just shouldn’t be in there. If you can find it, use vanilla bean paste. The vanilla bean is more carefully preserved in paste versus extract, so you’ll get a more intense flavor. 5. Chill your dough for at least 12 hours. We know, we just keep torturing you with long wait times. But think about your cookies the way you think about chili simmering on the stove. The longer it simmers (we’re talking hours, not days), the better it is. Once you make your dough, roll it onto a big sheet of plastic wrap in a ball, then wrap the plastic wrap tightly around the dough and place it in the fridge for at least 12 hours. We promise the wait is worth it.